Planning the second phase of the Helsinki West Metro project has required a lot of building information modelling (BIM) of the various structures being built. Solibri Model Checker has been chosen to create an overview of the new stretch of underground rail network in the capital of Finland. It can integrate designs created on a variety of systems and ensures a uniform scheme. The second phase of the Helsinki West Metro project will extend the city’s underground rail system from Ruoholahti in Helsinki to Kivenlahti in Espoo. Adding 7 kilometres of railway line and five stations – Finnoo, Kaitaa, Soukka, Espoonlahti and Kivenlahti – plus a new underground metro depot is a massive undertaking. The project is an addition to work completed in 2017 that saw the construction of a railway line of 14 kilometres from Ruoholahti to Matinkylä together with eight new stations. West Metro is a huge project with a large number of contributors. The second phase of West Metro is of a similar scale to the vast Kalasatama. or Central Pasila projects in Helsinki. West Metro is, however, built almost completely underground, so the enormous effort required is not as visible as the creation of new city districts built on the surface. West Metro is in fact the largest tunnel project in Finland and it requires the use of demanding building technology and automation. The excavation work of the Matinkylä–Kivenlahti stretch of line is almost complete, with a number of different contractors involved. The tenders for the building work are currently being calculated. The railway line itself is one project and the five stations run as individual projects. The building work on the line is divided amongst various contractors which requires numerous related contracts. The station construction work is similarly carried out by a number of firms in numerous related projects. In various technology areas modelling is created with different programs. The solution for interlocking the plans is to have clear planning rules and the use of Solibri Model Checker. Solibri Model Checker has been on the market for a long time with an established position as a user-friendly and functional software. In practice, there were no considerable competing alternatives for assembling the combined models for this project. The West Metro project has required numerous contracts. Aittoniemi shows on a computer screen a Solibri model where orange “fences” represent the borders between various contract areas. It is essential that all construction details meet each other in the right way at these borders. The combined model Solibri creates supplies an easy way to immediately detect any possible irregularities visually. Another essential thing, according to Aittoniemi, is avoiding clashes between HVAC and electrical systems and construction. In West Metro, there are two parallel fire-sectioned tunnels for the whole distance of the underground’s extended reach. 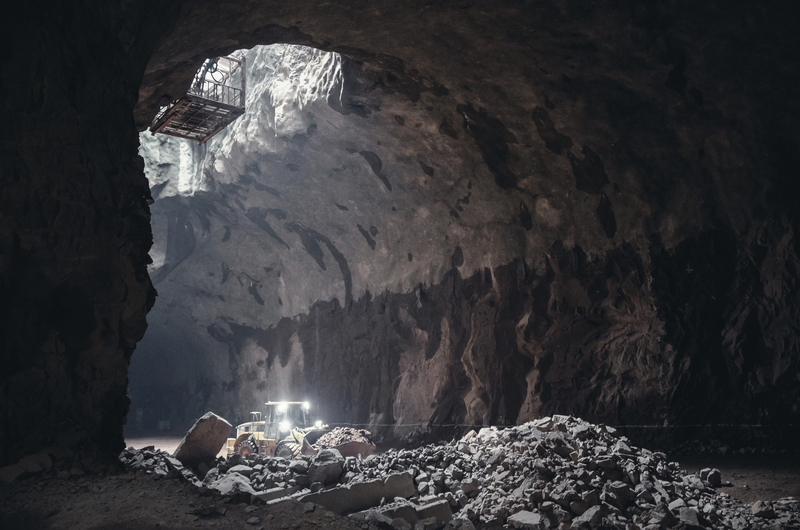 Most of the excavation is made by blasting because of the hard rock in Finland. Mechanical excavation is possible only with softer rock. To ensure the precision of plans, the whole excavated tunnel and station caves are laser scanned. The result is an exact surface model that shows the real available space. Previously, analogous measurements were made very roughly with a tachymeter. Aittoniemi, who has worked abroad for five years, is thankful for the operability of the scanned model. Five years ago it was very laborious to move the scanned model into the information model. Now it can be done very easily. There is always water underground, and it trickles into the excavated spaces from the small cracks in the rock. To conduct water to sewers, drains have been installed inside the layer of concrete that has been sprayed on the rock surface of the underground spaces. In the information model, the drains are shown as pink “worms” that squirm along the rock surface. The drains are much thicker in the model than in reality so that they are clearly visible in the model. In fact they are completely inside the sprayed concrete and are invisible to the naked eye at the worksite. The planning professionals appointed for the West Metro project must all have a certain level of modelling ability. All the design programs used in the project support the export of information models according to IFC (Industry Foundation Classes) standards. To ensure the uniformity of the models, IFC Export Instructions have been composed for the West Metro project. The instructions ensure that a model is optimized to suit its purpose and easy to match with other models. A simplified model is imported into Solibri Model Checker. ‘Simplified’ means that, for example, the construction model does not include reinforcement and the architect model surface colours. The importance of the information models is increasing as the project progresses. At the beginning only a few people made use of these models. Now the models have become common tools for West Metro organisation, inspectors, planning instructors and many others. Besides Solibri Model Checker, the free Solibri Model Viewer is widely used for observing and commenting on the models. The Solibri model has a key role between planning and construction. It gives the right information to the right people. In the second phase of the West Metro project, people jumped on board with little experience in the modelling and common modelling framework. Aittoniemi and Tulamo estimate that this will cause some extra expenses in planning, because some things will be done twice. They are, however, sure that the expenses will be returned many times in the execution phase as problems at the worksite will be avoided due to better planning. Aittoniemi and Tulamo estimate that the Solibri model provides an almost unlimited number of possibilities to use in executing the project. The model will also be an advantage when the underground system of the West Metro’s second phase starts operating. One can only a make wild guess at the number of ways in which it will be useful. Regarding future development of Solibri, the first thing the two men bring up is the advantages there would be in a light mobile version that could be taken into the worksite on a portable computer such as a tablet. Another of their wishes is related to rock engineering, where the software could show, for instance, fragile zones that require more reinforcement it may be contradictory to wish for both extra functions and yet portable simplicity, but altogether, the men are satisfied with modelbased planning and Solibri Model Checker. Assembling the vital combined model has been easy, and it’s the perfect illustrative tool for modelling the entire project. Even a large model, such as was required in this case, functions fast and intuitively in Solibri Model Checker. Thanks to these models, the schedule and expense of the project can be kept under control.